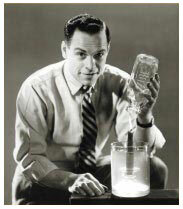 This is the Official Website of Television’s One & Only “MR.WIZARD”... started and originally maintained by Don Herbert and carried on by the dedicated staff of Mr.Wizard Studios, Inc. Don conceived, wrote, starred, and produced the NBC hit series “Watch Mr.Wizard in 1951 and became known as “America’s Favorite Science Teacher” by millions of admiring viewers for 14 consecutive years. His second major TV series “Mr.Wizard’s World’ first aired on MTV’s Nickelodeon channel in 1983. Running consistently for 78 consecutive episodes this series established Mr.Wizard as another household name to a new generation of fans. 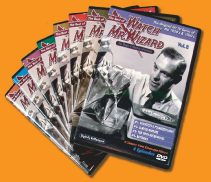 Mr.Wizard’s trademark ‘Hands-On’ technique of demonstrating science concepts to young people has been the inspiration to many educators who have followed his lead. 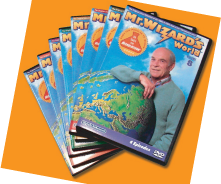 We have made available 32 Episodes on 8 DVD’s from his premier show‘Watch Mr.Wizard’ and have available 40 Episodes on 10 DVD’s from the magazine format favorite ”Mr.Wizard’s World”. We hope you enjoy our labor of love keeping alive the legacy of a True American Televisionary Icon. Smithsonian - Mr.Wizard's notes have been accepted into the Smithsonian's National Museum of American History, Archive Center 2015. Please see the article written by Anika Gupta for Smithsonian, from August 26, 2015. Episodes from the 1950s & 1960s Original TV Series on DVD!! Nickelodeon TV Series on DVD! !